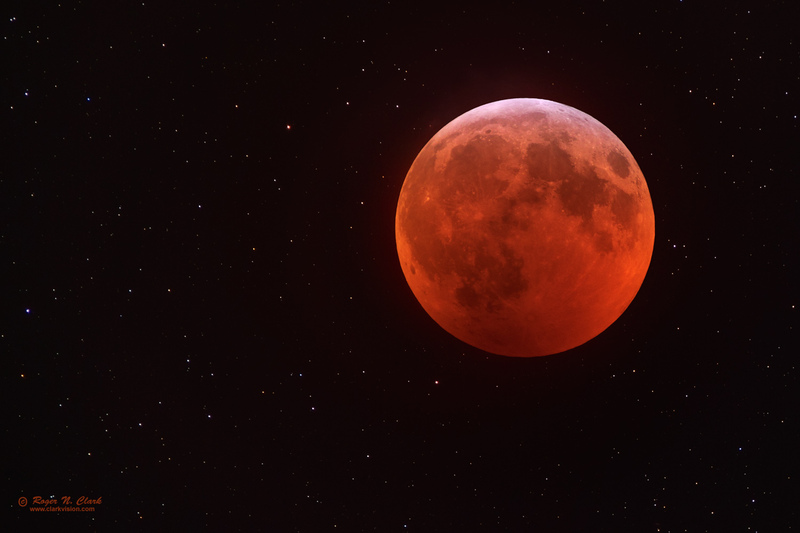 The Lunar eclipse of January 20, 2019 in the constellation Cancer. During mid eclipse, with the Moon quite dim, many stars can be seen and photographed near the Moon. 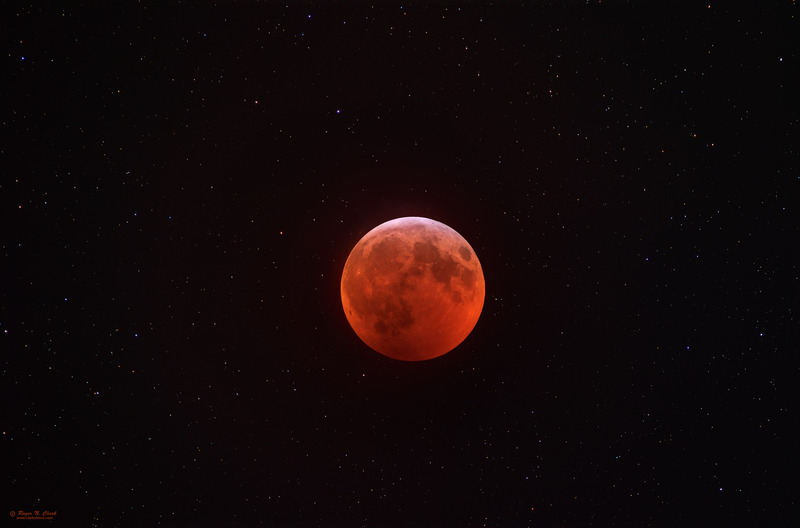 In this view, magnitude 16 stars near the Moon were recorded from a red light pollution zone (metro Denver, Colorado). Stars that faint can be seen visually in telescopes with at least 12-inches (30 cm) aperture. Technical. This image was obtained with a Canon 7D Mark II 20-megapixel digital camera and 300 mm f/2.8 L IS II lens plus a 1.4x teleconverter giving 420 mm, f/4. Forty five 15-second exposures at ISO 1600, f/4, were made for the star background during mid-eclipse, and four 0.6 second exposures at f/4 were made for the Moon just before the 15-second exposures. No dark frame subtraction, no flat fields. Tracking with a Fornax Lightrack II and no guiding. The total exposure time was 11.29-minutes. The full resolution is 2 arc-seconds per pixel. This view is half resolution (4 arc-seconds per pixel) and cropped from the full image. Full uncropped, half resolution image, 4-arc-seconds per pixel is here. Post processing: Raw conversion with Rawtherapee with settings tuned for astrophotos, including maintaining star color in saturated stars. The star background was stretched with rnc-color-stretch. Also see Astrophotography Image Processing Basic Work Flow.